Boys and girls love the colorful picture on the front of the hula dancers and the ocean and they also enjoy bouncing and jumping with their friends inside. You can order this bounce house with confidence because all of our inflatable rentals are cleaned and sanitized before the event. 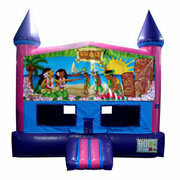 Our Luau unit is popular especially during the warm months of the year so you may want to call Bouncing Buddies and book early so you are assured of having your choice on your special day and rent our bounce house for your next party, or choose any of the other inflatable rental units we offer on our website such as our obstacle courses, water slides or our exciting dunk tank. Our Luau unit is popular especially during the warm months of the year so you may want to call us and book early so you are assured of having your choice on your special day and rent our bounce house for your next party or choose any of the other inflatable rental units we offer on our website such as our obstacle courses, water slides or our exciting dunk tank.Our Luau unit is popular especially during the warm months of the year so you may want to call us and book early so you are assured of having your choice on your special day and rent our bounce house for your next party or choose any of the other inflatable rental units we offer on our website such as our obstacle courses, water slides or our exciting dunk tank.